Installation Qualification (IQ), Operational Qualification (OQ), and Performance Qualification (PQ) are a set of industry standard terms for validation, and is often affiliated with software validation. According to the FDA, IQ,OQ, and PQ are a “legitimate way to organize software validation tasks at the user site” . Lab-Ally has created an IQ,OQ package to facilitate on-site validation for CERF software. 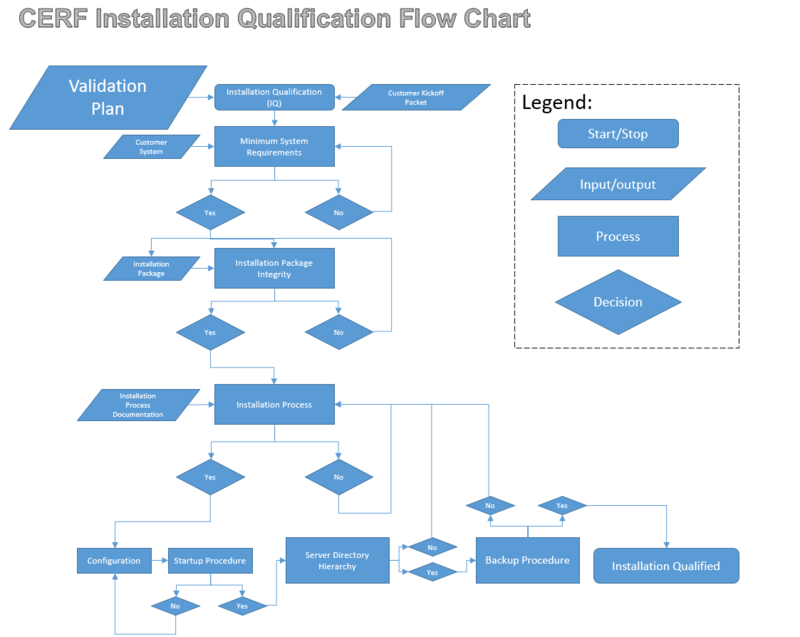 Installation Qualification is a validation that the software has been installed correctly. In the context of CERF, it is a validation that CERF has been installed correctly to Lab-Ally specifications. The IQ procedure will be fully documented, and will often be performed during, or directly after a software installation. The IQ of CERF is preferably done simultaneously with the installation. Operational Qualification comes after Installation Qualification. Operational Qualification tests, and documents that the software “operates” correctly within the pre-defined software specifications. Operational Qualification essentially tests that the software’s individual features and functions operate correctly and contribute successfully to the overall system. Performance Qualification tests and documents that the software is performing properly within the working environment. Performance Qualification is highly customer/user dependent and the procedure needs to be defined around the customer/user workflows. All three of these qualification procedures contribute valuable assets to Software Validation, and enhance the compliance of organizations in industry or academia. Lab-Ally offers CERF, a compliant, IQ, OQ ready e-notebook and document management solutions to meet the needs of your business or organization. Customers who install on-premise can choose to purchase our comprehensive IQ, OQ package that has been specifically designed to meet the demands of your regulatory or data keeping standards so that your organization can reduce risk, ensure compliance, and enjoy absolute peace of mind. A comprehensive IQ, OQ Validation package is offered by Lab-Ally for CERF ELN. Some of the activities which make up the IQ, OQ Validation Procedure can be seen in the figure above. IQ, OQ can also offer advantages to businesses that are not as highly regulated. Validation ensures that the software is able to perform its intended uses and functions with respect to the on-site implementation. Every organization has a different intended use, so validation must cover the unique needs of your organization and goals. Lab-Ally’s IQ, OQ Validation package is specifically designed to simplify Installation Qualification (IQ) and Operational Qualification (OQ) of CERF Electronic Lab Notebook. A PQ package can be defined with the help of the customer, but is not pre-defined as the IQ and OQ procedures are. Installation qualification (IQ) ensures that the right version of CERF has been installed to Lab-Ally specifications. Our Installation technicians can perform IQ during an install, or at any point after the install to analyze the quality of the CERF server. The IQ process includes validation of the assessing the correctness of the installation package, the configuration of the CERF server, and the proper unpacking of the CERF software bundle and it’s various components the configuration of the various CERF server, and a thorough, automated comparison of your new install and the CERF “Gold Standard reference server” maintained in our Columbus HQ. Our IQ process is extensively documented allowing organizations to decide whether to perform the process themselves, have Lab-Ally do it for you, or outsource the process to a suitably qualified and objective third party, depending on your budget, timeline and desired level of stringency. The IQ process is best performed upon first install, but organizations who already use CERF can also make use of our IQ package at the time of their next CERF update. The Flow chart above summarizes the IQ Validation activities during a CERF Validation Procedure. Please refer to the legend above for shape meanings. The decision points in the flow chart above are defined by acceptance criteria in the Validation Plan. CERF is a sophisticated system with a huge number of interacting components and many configuration options. Even with a proper installation, how can you make sure that CERF is going to work the way you need it to months or years after it has been installed? The answer is Operational Qualification (OQ). Operational Qualification tests CERF from its most basic functions to its deepest and most layered capabilities, such as signature workflows, document check-out and check-in, unique administrator privileges, and more. In addition, CERF OQ tests to the 21CFR11 FDA regulatory requirements for Electronic Records and Electronic Signatures. OQ is also an excellent training opportunity which could promote a deep understanding of the system both for new users to administrators. Although intended to be primarliy used immediately after installation, the OQ workflow can also be used at any time as a way to validate that your server is functioning as specified. The best way to certify that CERF will operate according to the needs of your organization is the Lab-Ally CERF OQ package. Enhance your compliance today with CERF OQ. The Flow chart above summarizes the OQ validation activities involved during the OQ procedure of CERF. We often get asked “is your software validated?”. It would be easy to just say “yes” and many vendors will do so without hesitation if they think it will help them to close a sale, but the truth is more complicated. In reality, almost any kind of software validation depends on a wide range of factors and variables that are often external to the code of the software. The specifics of your hardware, network, deployment, server configuration, training and usage patterns can have a huge effect on whether or not your enterprise software system is actually doing what it is meant to do to keep your data safe. To be absolutely sure that this is the case, it really does not matter what the software does in OUR test environment. What really matters is how the software performs when used in real-world situations and with real world data in YOUR environment. This is why it is critical that the The IQ, OQ validation activities above ashould be done in-situ at the customer site by either a customer or a Lab-Ally Validation Specialist, or Third Party expert overseen by Lab-Ally or by a Lab-Ally Validation Specialist, overseen by the customer. Often in the industry performance qualification (PQ) is mentioned alongside IQ and OQ. Performance Qualification is a protocol which validates that the software performs as expected in the in-situ true working environment. Performance Qualification does not test to engineering functional specifications, and are instead based on the user requirements and workflows, which vary greatly from user to user. In order to perform Performance Qualification correctly, Lab-Ally will work with the customer to define their own PQ procedure which validates the unique CERF functions that are crucial to individual organizations. CERF PQ can not be a “one size fits all” operation, and Lab-Ally will work with customers to create a PQ package that is complete and useful to them. If the document becomes too cumbersome, another document may be created called the Project Plan which will describe logistical items above, thus reducing the complexity of the Validation Plan. The Validation Plan is the first significant documentation effort of the Validation Process, and should be signed by qualified members from the party receiving Validation efforts, and the party performing these efforts. Upon signature, the plan is enacted and it becomes the official guiding document for the process, which leads to the testing process. The testing process occurs for IQ, OQ, and PQ activities, and is documented thoroughly. Any issues anomalies, issues, or defects with the CERF software, hardware will also be documented during this process, as described by the Defect Management section of the Validation Plan. Once the test cycles are concluded, the results will be analyzed against the acceptance criteria, to determine whether or not the particular entities passed or failed. The acceptance criteria should also be defined in the validation plan. Lab-Ally has created a slideshow for this content. Please see below. “General Principles of Software Validation; Final Guidance for Industry and FDA Staff.” fda.gov.